Early in February of 2016, BMWC was awarded the installation of a new dust collector system for Units 17 & 18 at NIPSCO’s Schahfer Generating Station. This new system collects airborne dust as generated by the coal processing operation before it escapes from designated pick up points. From the early stages of the project, a strong partnership developed between the BMWC team and the NIPSCO Major Project Team. Daily meetings and multiple phone conferences occurred. The original PSEP (Project Safety Execution Plan) was 10 pages and grew quickly into a 1” binder. Weekly meetings were held which called for changes and additions to be relayed down to the craft sometimes on a daily basis. The PSEP truly became a living document. Aside from the normal recognized hazards associated with the project, new hazards needed to be mitigated. The new equipment and associated ductwork that was designed to be installed while the existing dust collection system was still in operation was one of the first hazards encountered. Communication had to be flawless between the BMWC Project Team and NIPSCO since they would be conducting fueling operations while we were performing system installation. This required hot work that had to be performed in highly combustible areas. To allow this to occur safely, the Project Team zoned the project into four different areas. Each of these areas had its own hot work plan, rolling scaffolds to straddle the operating conveyor system and a LOTO procedure for the operating transfer car. Performing this work next to an operating boiler during a summer heat wave required us to have air conditioned break areas and a rigid heat injury prevention plan as well. 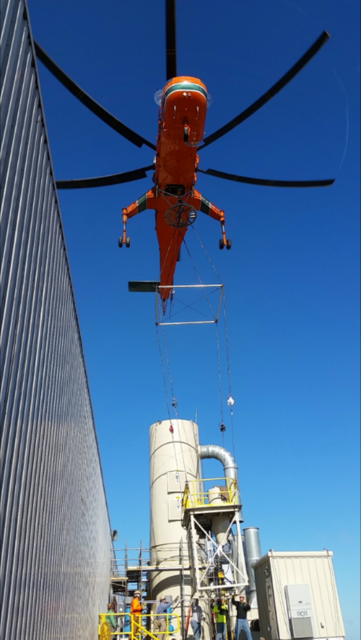 As that stage of the project progressed, and since the new equipment was to be installed on the unit’s tripper floor roof 200’ above ground elevation, helicopters were needed to execute the next phase. This involved working with two different helicopter vendors. Again, the planning was intense. Working with a composite crew of Boilermakers, Ironworkers and Pipefitters, including multiple sub-contractors, rigging plans and lift schedules were developed. 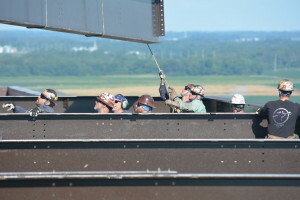 This also required detailed JSA’s (Jobsite Safety Audit) and safety briefings prior to the helicopters arrival on site. The lifts were divided into three days of lifting. On the first day, we planned and executed a set of 45 lifts. The lifts were unique in that we were not just lifting material but also had the crew(s) pinning, connecting and building the required steel structure for the equipment while it was suspended by the helicopter. This was followed by a second day of lifting 48 loads to set equipment, bundles and material on the newly erected structure. The last set of lifts, due to the load weights ranging from 6,000 lbs. to 18,000 lbs., required a larger aircraft. An Erickson Sky Crane was utilized for these lifts. Again, the crews performed mate up and bolting operations while the loads were suspended by the helicopter. The final steps of the project included performing tie-ins and seven weeks of startup and commissioning along with the demolition of the old system. The project worked over 18,500 man-hours injury free. This is in addition to the 68,852 man-hours the team managed concurrently with two planned outages and multiple forced outages at the three NIPSCO generation stations. Congratulations to the BMWC NIPSCO Project Team consisting of Mike Keneson-PM, Brad Bechinske-PM, Ron Beverly-Project Superintendent, Mike Wagner-QC, Ben Bryan-PFGF, Doug Patton-Project Safety Manager and Chad Smit-BMGF for all their planning, communication and execution of the work. 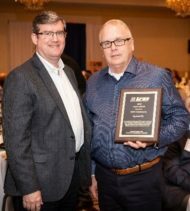 Their hard work on the NIPSCO 2016 Unit 17 & 18 Dust Collector Project won the Construction Advancement Foundation’s 2017 Industrial Project of the Year. Click here to see CAF’s article featuring BMWC and our work on this $12,000,000 project.